Above picture: D.O. 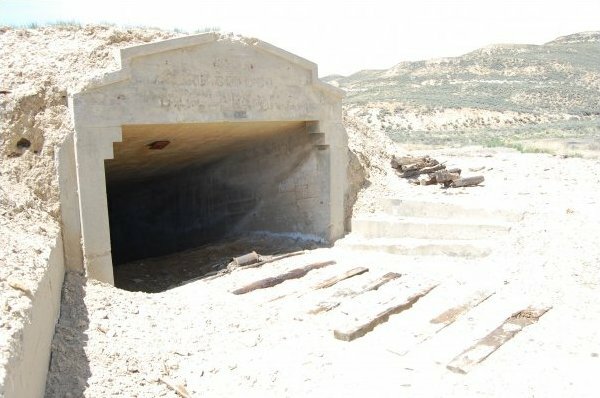 Clark Mine portal, uncovered in the fall 2009 during a Abandoned Mine Lands statewide coal reclamation project; picture taken by the Town Clerk M. Maes-Ekker. Superior, Wyoming is located just 23 miles east from Rock Springs nestled at the foot of the panoramic Continental Divide. We invite you to enjoy a modern day voyage into yesteryear to a town forgotten by time. Superior remains a diamond in the rough for those seeking real adventure in authentic old west sightseeing. In its heyday, Superior was a bustling town of over 3,000 lured by underground coal mines. Today, 336 hearty souls keep this isolated “Ghost Town” alive. Superior’s residents thrive on their isolation and “let the world go by” yet are always happy to direct visitors to local points of interest. For the adventurous, Superior offers hours of “treasurer hunting” at the all but vanished old town site or at one of the many old dump sites, you may also choose wild horse and wildlife viewing. A photographer’s paradise awaits your pleasure, providing “ghost town” snap shots that will amaze your friends. Superior maintains over five acres of parks, two modern public restroom facilities, baseball diamond, basketball court, children’s playgrounds, lighted tennis court, picnic tables and shade trees. At nearly 7000 feet above sea level, Superior’s summers are warm (but not hot) and nightly temperatures cool between 40’ to 50’ F. Far from city lights the heavens reveal more stars than most people have ever seen, while a gentle calm graces the area with relaxation and comfort. Located in the heart of the largest mass of unfenced land in the lower 48 states, you will experience our brand of freedom traveling in any direction desired through wide open spaces. The colorful past live on in the historic Union Hall. Once boasting a dance hall and state, saloon, grocery store, bowling alley, doctor and dentist offices; today, the Union Hall features a self guided, interpretive walk-through park. Here, preserved, lie epoch tales of the town’s origin, rising through the heydays and the hard mining life awaiting numerous immigrants and pioneers. On Interstate 80 a sign bids one to visit a “living ghost town”. Should you follow its advice after a 7 mile journey through Horse Thief Canyon you would come upon Superior Wyoming once a thriving community dependent upon its coal mines. Located down Horse Thief Canyon, Superior witnessed many exciting days. In days gone by this Canyon was to have been a rendezvous for early day outlaws. Not only could they resist capture, two natural corrals supplied both grass and water for their stolen stock. Numerous underground passages and caves are near the corrals. Superior was a melting pot of races, religions, nationalities, cultures and music. Growing up in a small town you learned to appreciate the differences in people. Families of the same nationalities socialized together. Many of the adults had recently come from their native countries and did not speak English. They brought with them their customs, music and foods. Children of all nationalities socialized, attended school together and went to the homes of their friends. They had the advantage of listening to music, eating food characteristic to the parents’ native country and enjoying the customs of their friends. While in each others homes, they learned to understand some of the language and speak words and phrases. They learned to appreciate different foods. On December 31, 1936 thirty three nationalities were shown on the payroll of the Union Pacific Coal Company’s. This is the list and goes from high to low the number of people in each nationality: Americans (white), Austrians, Italians, English, Finlanders, Slovenians, Greeks Scots, Croatians, Tyrolese, American (colored), Dalmatians, Japanese, Russians, Swedes, Germans, Irish, Polish, Serbians, Mexicans, Hungarians, Welsh, Canadians, Belgians, French, Bulgarians, Danes, Spanish, Holland, Romanians, Australians, Montenegro and Chinese. In the census take in April 1940 Superior’s population totaled 2400 which was a drop but with the World War II need for more coal the population was again increased. Superior itself was strung out in a large area. It was approximately 3 ½ miles from end to end and 1 ½ miles wide. White City or South Superior had a population of 900 people, Copenhagen’s population totaled 175 and the population from North Superior which included “B” and “C” Hills and “D” Camp was 1325. The population dropped off considerable after that last census. This was probably due to the closing of various mines, but the people were optimistic with the new D.O. Clark Mine and general improvements in the town. The beginning of the end of Superior can be seen in the 1960 census. South Superior, although its figure was less than half of the 1940 census figure, was not affected as much by the closing of the mines since they had always been less dependent upon the Union Pacific. The coal camp was a picture of democracy in the action for here; all nationalities worked and planed harmoniously, each, in their own way, contributing to the formation of a new culture. The obstacles they overcame, the growing pains which were endured in the building of a community were also leaving an indelible mark on Wyoming’s history. The history of Superior, City of Hills, is the story of coal and of men. Morgan Griffiths and a party of prospectors set out from Rock Springs to prospect in Horse Thief Canyon, where it was known that deposits of coal existed. The party traveled 20 miles to the point where outcrops of a promising coal deposit had been reported. The small party pitched a main camp of three tents in the canyon and began surveying for new sites. By 1901 there were more than 100 tents composing the camp. Many of them held whole families who were anxiously waiting for the opening of the mines which promised to be rich in the greatly needed ore. The initial “city of tents” obtained fresh drinking water from a nearby spring and had an abundance of deer, antelope and sage chickens. Commissionary wagons from Rock Springs made periodic visits to the camp. In good weather it took a full day by buckboard. From the surrounding hills, the tents looked like a large field of white. It soon acquired the name “White City” which stuck with it even after the tents had been replaced by wood and brick buildings. The canyon was named by the early settlers, who claimed that a gang of outlaws had made this a hiding place for stolen horses. Gus Paulson was in charge of the field work. The Union Pacific Coal company pitched tents in the canyon to use as the main camp. The coal mined in 1906 was 12,007 tons; this had risen to 890,735 tons in 1916 when the Superior Coal Company was merged with the Union Pacific Coal Company on May 1, 1916. In 1954 the production was 520,536 tons. In 1955 the production had increased to 558,757 tons. This amount was produced by one mine working two or three days a week. At one time there were five different coal mines in Superior. They were A, B, C, D and E. “A” Mine was located in a small canyon just south of Superior which is now the old dumping grounds. “B” Mine was located just across Horse Thief Creek from Main Street in South Superior. “A” and “B” Mines opened April 30, 1906. “C” Mine was located in a hillside just across the creek from C-Flat and opened in October 1903. “D” Mine was located in the northern end of D Camp. “D” Mine opened June 30, 1906. “E” Mine was located at the foot of C Hill where the school bus unloaded and opened in 1910. In 1913-1914, two more mines were opened here. They were Premier and Copenhagen. In 1938 the Union Pacific Coal Company opened up the newest and most modern, the D.O. Clark Mine, it was also the last coal mine opened in Superior. The D.O. Clark Mine was named in honor of D.O. Clark who did so much to pioneer coal mining in Wyoming, Colorado, Utah and Washington. This new mine was modern in every respect. Mr. Clark came to the properties in 1868, while serving as bookkeeper for the Wyoming Coal and Mining Company; his office was located in Omaha. From then until 1911, he held many positions with the Union Pacific Coal Company. His first position was Superintendent of the coal department of the Union Pacific Railroad Co. from 1874 to 1890. From 1890 to 1895 he was assigned to special duties. From 1895 to 1904 he served as Superintendent of the Union Pacific Coal Company; from 1904 to 1911 he occupied the position of Vice President and General Manager, returning in 1911. He then moved to Towanda Pennsylvania, where he resided until his death on November 21, 1921. Copenhagen was another camp within the Superior city limits. The house and buildings were put up and owned by the Rock Springs Fuel Company. There was a mine office, bath house and homes for the families of the men that worked in the Copenhagen Mine. There was no business section in this camp. The tipple and mine was very close by the camp. For many years Frank Gates was the Mine Superintendent. On October 24, 1936 the Copenhagen Mine Tipple burned. There was total destruction to the tipple and screening plant. The monthly publication of the Superior High School was the Kabibonokka, the word translated meaning “North Wind”. The coldness of the winds sweeping down over Superior high lands during a substantial portion of January fully justifies the young people of the Superior calling it almost anything they might see fit. However, we will assume that the translation is a thoroughly respected one. In 1937 when Miss Doyle was in charge of the paper and Margaret Ruth Richardson was the editor-in-chief, a change was made in the annual. It had always been named the Kabibonokka the same as the monthly newspaper but in 1937 it was given the name of Dragonette. This name was used until it was no longer published after 1962. The Union Hall was built in 1921 and competed in the fall of 1922. The building was paid by its initiators, the Union Mine Workers of Superior. The Union Hall celebrated its inauguration in December 1922. Miners of Superior paid $2 a month to cover the cost and maintenance of the building. The Union Hall is a three story structure built of solid brick. The front side of the building stands on Main Street of Superior. Its appearance has some decorative features that resemble the time when it was built. On the highest and center of the building, there is an emblem that has the letters U.M.W.A. (United Mine Workers of America). Long windows cover the front wall of the second floor as an entrance to the upstairs. The building was meant to serve the community in many ways. The upstairs was a big room with a state, and it was used for dances and union affairs. Every Saturday the Union held meetings in the mornings and dances in the evenings. The hall held an average of three hundred people during the dances. The front side of the second floor was sub-divided into two offices. The left side was a dentist office and the right side was used for a private office. The left side of the first floor was designed for a hospital. The right side of the first floor was a grocery store. The basement was used as a parking lot that held from fifteen to twenty cars. During the early 1950’s the Union Hall was remodeled. Changes were made to the hospital, and it became an outpatient clinic together with a suite for doctor’s offices. The basement was converted into a bowling alley. The reconstruction cost $27,000.00. In 1962 the mines closed down and the Union Hall died with the town. July 1909 marked the birth of one of the greatest building in Superior’s history. The massive building which consisted of a kitchen, stage, dance floor belfry and several other smaller rooms, was erected by the Union Pacific Coal Company to occupy the needs of Superior’s population. One of the most important uses was that of a basket ball court for the Superior Dragons, who did not have a gymnasium of their own. The large area, the dance floor, was more than enough for the exciting games. The enthused throngs crowded onto the stage and sidelines to watch the thrilling games, against A class teams, such as Rock Springs, Rawlins and Kemmerer. The play by play account was broadcasted from the belfry tower which overlooked the entire building. Because of its outstanding performance in play acting and opera, the structure soon got the name, “Opera House”. In 1944 the Opera House became known as a roller skating rink. It was run by Earl and Bob Pittam. The Opera House met its final day on January 7, 1962 at 1:05 when it caught fire. The starting of the fire was the electric wires in the roof. When the air got to it the whole building when up in flames. The Superior and Rock Springs Fire Departments were called to fight and keep it under control. The Opera House was too far gone to try to save. The heat was so intense that it melted TV antennas and scorched buildings around it. The Club House was built next to the Opera House, was completed in 1928. This building was used for scouts and for other meetings. It could be rented for $0.50 cents and with that came the use of the dishes, card tables and chairs. Many of the ladies entertained their card clubs here. Public card parties that were sponsored by organizations or class sponsored were held here. Many of the young girls had their Bridal Showers in the building. The facility had to be cleaned up by the people renting it. The following article describing the Club House was in the Employees Magazine, November 1928. Konstandinos N. Thomathakis, better known as Gust Thomas said it will take two more years to finish his much praised building, the “C” Hill Acropolis. Starting the building on April 14, 1929 with 14 helpers, Gust had made the three storey buildings into a basement garage, confectionery and boarding house. When Gust was a lad of 15, the Greek government sent him on a mission to the United States to build an “Acropolis” which would serve as a benefactor to society. Upon landing in New York, he went to Bingham, Utah to work in the copper mines, but due to climate condition he was physically incapacitated to start an Acropolis there so he came to Superior, bought a piece of land and started the “C” Hill Acropolis. “Several years ago” said Gust “representatives of the Greek government came here from Greece to see if I had fulfilled my order”. These men took back with them a picture of the building which was placed in the Acropolis Museum in Athens, Greece. Pictures of the building were also entered in the World’s Fair at San Francisco and New York City. Gust Thomas was born in Ellas, Greece. In 1910 he was made a Member of the Y.W.C.A. “Also in 1910, I was made a member of the Relief Society which sent help to the cholera stricken Chinese, at that time, quoted Gust. In his spare time, Gust played the fiddle which he made. Gust says he also writes life histories of different people and had written 1900 of them since 1910. This was the interview, believe what you want to about the information given but the residents of Superior could see a building made of stone on the top of “C” Hill and Gust lived in it for many years. He also had a candy shop there. Superior was sometimes called “Little Siberia” due to the extreme cold winters. Although the average temperature is 42 degrees, the thermometer sometimes records 20 degrees to 30 degrees below zero and soars to 100 degrees in the summer. Seasons are really three rather that four. The Wyoming summers are so short that spring merges into fall. The altitude of Superior is 7000 feet above sea level. The wind blows sometimes sixty miles an hour. The most helpful of the winds is the Chinook, the warm wind which melts the snow. Yet because of the high altitude, days of sunshine, and low humidity, even the coldest days, are not know to be uncomfortable. That Superior was known as Reliance until July 14, 1906. That Morgan Griffiths led the first prospectors to Superior. That this canyon was known as Horse Thief Canyon. A gang of outlaws had made this their rendezvous and hiding place for stolen horses. That Superior mines were originally opened by the Superior Coal Company. That the Superior Coal Company was merged with Union Pacific on May 1, 1916. That Wyoming has the largest bituminous and sub-bituminous coal reserves of any state in the Union. That Wyoming has more coal than all European nations combined. That Superior had two banks. At one time Superior could boast of two banks, one laundry, skating rink, bowling alley, two Post Offices and a black smith shop. “A” Camp was once a totally Japanese camp. The men and their families were brought to America to settle here. They had their own schools and stores. During the 1918 flue epidemic, many residents of Superior died. The sick people were housed in the “pest house” which stood at the bottom of B Hill. There was no dry creek running through Superior when it was first settled. It has just slowly eroded and dug its way down to the size it is today. The author of “A Wyoming Doctor’s Children” once resided in Superior in a rock house on C Hill. Superior is mentioned in this book. The 1962 Dragonette was the last issue published. When education was first established in the town of Superior, there weren’t any centrally located elementary and secondary school buildings. Instead, education in Superior had its origin in 1907 with about three private homes which provided schooling for children ranking from six to eleven or twelve years of age. These were located at D Camp, B Hill and what used to be the A mine territory. In early Superior the horse and wagon was the chief means of transportation. The commissary wagons made periodic trip from Rock Springs. It required an entire day to drive by buckboard and mule team from Rock Springs to the camp. It was not unusual in winter time, when the commissary was overdue, for the prospectors to shoulder their shovels and find the buckboard struck fast in a snow drift. Sometimes the men worked for hours before they could clean the trail sufficiently for the rig to reach camp. About 1903 plans were laid for the construction of a railroad from Thayer Junction on the main line to Superior. A depot was built, which had an office, freight room and agents living quarters. The railroad was used for the transportation of freight and coal from the mines and also for passengers. If a person from Superior desired to go to Rock Springs, he usually had to stay over night so it was a two-day trip. People live not only to work and make money, but to enjoy pleasure and recreation and culture as well, and the people of a mining camp are no different in this respect than those of other localities. The various Fraternal Organizations were the Elks, Knights of Pythians and Italian organizations. The women’s organizations were the Rebekah and Phythian Sisters which thrived vigorously. The Union Pacific Coal Company’s Old Timers Association held its first reunion at Rock Springs on June 13, 1925. Superior had a membership of 126 in 1953. Thirty-two nations were represented in the membership from this region. Some of the nationalities were: Americans 338; Englishmen 53; Greeks 24; Jugo Slav 22; Slavs 23; Dalmatians 9; Austrians 77; Finlanders 45; Italians 54; Scotsmen 20; Tyroleans 14 and Swedes 8. So you can see that this nation is a Melting Pot of the nations. The company wanted the people to enjoy life and have a community spirit and participation as well as working for them. The company and residents were integrated to try to make life as enjoyable as possible. A Community Council was formed in January 1930 and the aim was to promote all phases of neighborhood work including recreational, social, musical, civic and charitable. It was their desire to foster anything for the good or good-time of the community. Numerous saloons and dance halls added to the recreational facilities of the town. The first Union Pacific Coal Company store was established in 1905. This store known as the Company Store had been the center of the camp’s business activity due to the check-off system. The first building in South Superior was the Combination Saloon. It was built in 1909. Next came a bank called the First Bank of Superior. Another bank sprang up, it was called the South Superior Miner’s State Bank. This bank was a branch of the Rock Springs First Security Bank. These two banks ceased to operate after the depression. In 1911 and 1912 a drug store and The Crystal Theater were established. The Crystal Theater was opened in 1912. It was operated by Mr. and Mrs. A Markanen. The films were silent and the pictures were accompanied by music being played on the piano. One of the earliest pianists was Mrs. Eliza Hicks Smith. The Crystal Theater was run by Louie Genetti and then by Tom and Minnie Stephenson. During the 30’s Friday Night at the movies was Bank Night. Each week $10.00 was added to the account if it had not been won the past week. In order to be a winner, you had to be present at the drawing. Each Friday there were two showings of the movies and between the first and second showing a name was drawn as the winner. If you were not at the first showing but had a ticket and were in the lobby waiting for the second showing you could be the winner. Besides the saloons, the Workingmen’s Commercial, the Mercantile and other concerns were established. The Union Mercantile was established in 1909 was first owned by Joe Berti and John Bertagnoli until it was incorporated under the name of Union Mercantile. The first manager was Eugene Bertagnoli. This store served Superior until March 1956, when the stock was moved to the Union Mercantile in Rock Springs. The Workingman’s Store was established in 1910. August Wilson was the first manager. On December 28, 1913 a fire broke out in Joe Berti’s Combination Bar and Restaurant and almost destroyed the entire business section of South Superior. Five buildings were destroyed in this fire. They were a hall, drug store, Workingmen’s Commercial, and two bars. These buildings were replaced by brick structures. The Union Mercantile and the Workingmen’s Commercial were department stores. They included dry goods as well as meat and groceries. The business section of Superior was along Main Street on one side of the road. The following buildings and businesses were along the street. There was a garage and filling station, Golden Rule Novelty Store, Laundry, Western Meat Market, Shoe Repair Shop, Bakery Shop, Bank, Dentist office, Alberta Hotel, Drug Store, Duzik Grocery Store, Beauty Shop, Jackson Café and Rooming House, Gratton Café, Harshbarger Barber Shop, John Bettra Barber shop, Pruja Pool Hall and Saloon, Palace Bar, Eagle Pool Hall, White City Bar, Combination Bar and Pool Hall, Houses of Prostitution or “Cat Houses”, the Union Hall and the Finn Hall. The railroad tracks ran through the main part of the town and on the other side of the tracks was the Crystal Theater, Angeli’s Garage, Town Hall and Fire Station. There were also several homes and an apartment building. One unique store was owned and operated by the residents of what was known as “Jap Town”. The Japanese had been hired by a scout sent by the U.P. Coal Company when the mine was first put into operation. They located on the far eastern tip of the camp. These residents boasted of exceptional artists, wrestlers, tennis players, teachers and those with other varied talents. In 1911, the towns of North and South Superior were incorporated but the locals still referred to the southern part of the town as South Superior or White City. The first Mayor of Superior was Feliz Jackson. When August Paulson became mayor in 1913 the following ordinance was enacted. The ordinance prohibited animals and livestock from running at large and declared them to be a nuisance, and proved a penalty for those breaking the ordinances. This ordinance was approved on October 30, 1913. In 1941 Joe Bertagnolli had been the mayor for 16 years. The following interview was in the Kabibonokka on February of 1941. Mr. Bertagnolli was born in Trent, Italy but had lived in the United States since 1912. “When I came to Superior there were only 12 houses and the people were still living in tents up around the depot,” said the mayor. During the 16 years that he was mayor, the water tanks, Front Street and other streets were improved. The Town Hall was built and a new fire truck was purchased. “The first fire truck Superior had was a cart driven by men and later by horses” laughed Mr. Bertagnolli. When he asked if he thought Superior would have an oiled road through the Main Street he replied, “We are doing the best we can to get one and we’re working on it right now”. Mr. Bertagnolli’s favorite sport is fishing and he concluded by saying that he is also in the ranching business. The pool was originally started as one of the “alphabet projects” under W.P.A. the intention then being to improve the athletic field and construct a pool. Funds to carry on the work soon became exhausted and the job was “temporarily” abandoned. All hands took up the plan to complete the project, the School District, Community Council and others became active, mine employees assessing themselves monthly to assist in defraying the expense. Among the improvements a 50 by 90 foot swimming pool. The water for the pool came from the mine, being chlorinated and changed weekly, fifty trees planted, a lawn 200 feet by 150 feet sown with grass and clover for the citizens and children of Superior and South Superior to enjoy. There was no running water in Superior in the good old days. Water was hauled in tanks. As it came from the mine, it was murky and inky for several days before it was used. Each family had several barrels used for water storage. When girls wanted to wash their hair, they would go to the machine shop and get water that came from the steam pipes. Water for domestic use was hauled from the springs to the storage barrels that stood before the houses and stores sold for twenty-five cents a barrel. The water was then hauled throughout the community by wagon, which held twenty and fifty gallon containers. Later the railroad company hauled water from Point of Rocks in tank cars. This water was quite expensive so they preferred to carry their water from South Superior in five gallon buckets. It was not uncommon to see a long line of people waiting their turn to fill their buckets from the pump. A water system was built during the first World War. The first telephone system installed in Superior was in 1949. The Union Pacific Mine Office, Company Store, Copenhagen Mine Office and the depot had telephones previous to this time but were business phones and not for public use. The only public telephone was at the DeGuio Shoe Repair Shop. The outside world could phone here and then the DeGuios would notify the people of the phone or they would take a message and deliver it. In 1949 the first telephones were installed in homes. Most messages were received at the depot via Western Union Telegraph. The depot agent received the messages, typed them and they were delivered, usually by the children of the depot agent. Fifteen cents was charged if the messenger had to go one mile from the depot. The Denver Post, Salt Lake Tribune, Rocky Mountain News and the newspaper which is now the Rock Springs Rocket Miner were brought in daily on the Superior stage. These could be picked up at the local drug store. Nearly every family had at least one radio. News and programs were listened to by the family. Most of the people had electricity furnished to them by the power plant. This plant was located at the foot of C Hill and the old shop. Life in the United States was changed forever on December 7, 1941. It affected people living in urban, suburban and rural areas. Superior did not escape the many changes. Young men were enlisting and were drafted. Girls were nurse cadets. Many of the young women moved to other states and worked in war production plants. The men in the coal mines were working double shifts. The young men leaving left a gap in available employees. Women were hired to work on jobs outside the mines. This did not completely solve the problem so the company began to go outside the state to recruit workers. Families came from many states so the father could work in the mine. Most of them came from Arkansas and Oklahoma. Due to the increase in population, the company made homes for the new residents by using box cars. They were placed on foundations and two put together for larger homes. There was meat, canned good and sugar rationing. Gasoline was also rationed. America was not yet involved in the European war when the faculty of Superior Schools donated $26.50 to the British War Relief Fund. This money along with thousand of dollars from all parts of the country was sent to England to help its unfortunate citizens. This fund started right after the first bombing raids on London and other parts of Britain. In these raids thousands of women and children were killed, injured or left homeless. The drive was to relieve some of the suffering. The United States government decided that all people of Japanese descent could not be trusted to work in the railroad and in other jobs, and they could not live in some localities of California. The well respected family of Tanimines had to move from Superior. Mr. Tanimine was the Section Foreman on the Union Pacific Railroad. Some of the children had graduated from high school two of the children were still in school. Unhappy to see their friends leave, the students of Superior High gave James and Bertha Tanimine token of remembrance. Bertha received a Schaeffer pen and Pencil and James received a wallet and belt. The Boy Scouts gave him a canteen. Some of the citizens registered to be Civilian Defense workers in case they were needed. Each adult registering had his or her choice of what they could do in an emergency. Some of the choices included giving first aid and driving an ambulance. Girls from the high school were also recruited. They were to give 3 hours every day of their summer vacation to work at a Control Station for Civilian Defense which was located in the Town Hall in South Superior. The girls volunteering were Betty Welsh, Helen Zancanella, Marlu Harris and Betty June Richardson. Mr. Joe Bertagnolli and Mr. Dave Gifillian were chairman for the program. In the springs of 1942 registration took place for the sugar rationing. There were 2419 people registering but only 2169 received rationing books. Those who did not receive books had enough sugar on hand. At “B” Hill 1142 registered and only 1018 qualified for the books. South Superior registration was 1277 and 1151 were eligible. Superior Boy Scouts collected paper. The scouts collected it and it was bailed and sent by express, free of charge to Salt Lake City. In the August 1946, the Employers’ Magazine recorded that 192 men who had one time worked for the Union Pacific Coal Company had served in the armed forces. This did not include the men that worked in other fields. The American Legion Twin City Post No. 74 put up a War Memorial for those who had served from Superior in both the World War I and World War II. Alexander Dixon Daniel A Dolence Tony Dolence Jr.
Anthony Legerski Frank Legerski John F Leosco, Jr. The names of those serving in the World Wars I and II were taken off the memorial in Superior. If any names have been omitted I am sorry.